Hair fall is the most frequently encountered problem likely to affect most people at least once in their lifetime. However, it can be curbed immediately, if you take prompt action. 1. Shampoo hair regularly with shikakai, amla, and reetha nuts. 2. Combine together 5 tbsp of pure, undiluted coconut milk with 1 tbsp of lemon juice. Massage well onto scalp. Allow it to dry. Wash off thoroughly. 3. Beat 2 eggs along with 3 tbsp of water and apply it to the hair roots. Rinse off. This prevents hair from falling and strengthens the roots. 4. Massage whipped egg-white all over the scalp. Allow it to dry before washing off. It nourishes your hair and arrests hair fall. 5. Make a thick paste of methi (fenugreek) seeds and wash hair with this. 6. Regular massage with warm castor oil goes a long way in promoting luxurious hair growth. 7. Use aloe vera oil regularly. 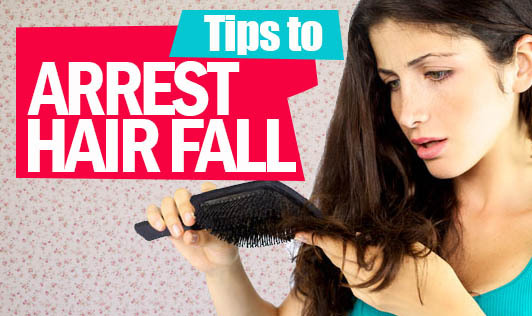 Adopt these simple tips to arrest hair fall and flaunt vibrant hair all year long.